Nature vs Nurture: How do baby birds learn how to fly? As humans, it is inevitable to believe that we are born into this world with an instinct; an unknown conscious which is the means to our development. Without this instinct, many of the activities we take for granted would be a prioritized thought (i.e. breathing, sleeping, and walking). If humans were not born into this world with an instinct, everyday life would be a struggle because our minds would have to think each reflex through for every movement. Many have argued that this development is due to nature rather than nurture. The idea that one is born with these abilities and as they grow older, they naturally start to become more accessible. Although many years of research has proved that while these instincts are given to us at birth, it takes exercising and motivation by parents to help babies reach their full potential of instinct. This idea is the nurture half of the argument, where people argue it is the responsibility of the parent to teach these children how to perhaps walk or eat properly. Similar to humans, birds are born with this same instinct, mainly for the action of flight. Now no bird is born with the ability to fly because it takes practice. Rather birds are trained by their parents through the power of reinforcement. Let’s compare the flight of a bird to how a baby is trained to walk. One parent may stand on one side supporting the baby, while the other parent stands across from them holding something of value to the baby whether it is a toy or food. The idea is that the babies’ excitement to obtain whatever the parent has to offer, is what the baby uses as its motivation to leave the first parent and attempt to walk on its own. Obviously this will take a few trials because the baby needs to learn from its mistakes. Every time it will talk a little bit farther until it has finally reached the second parent. This idea of reinforcement is very similar to that of a baby bird. 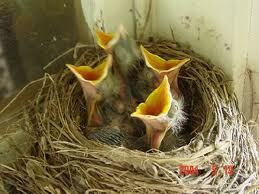 The main source of motivation for baby birds is food. 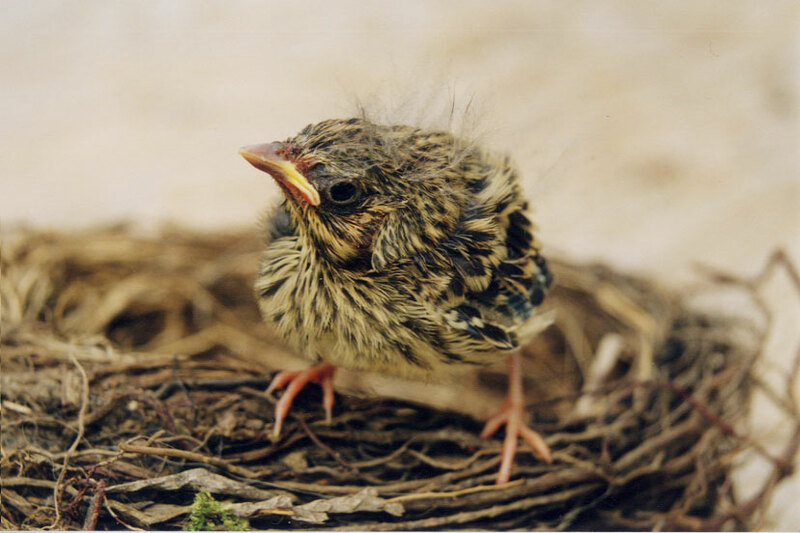 The baby bird knows nothing more than that at regular intervals their mother will come and drop some food off in their mouth. 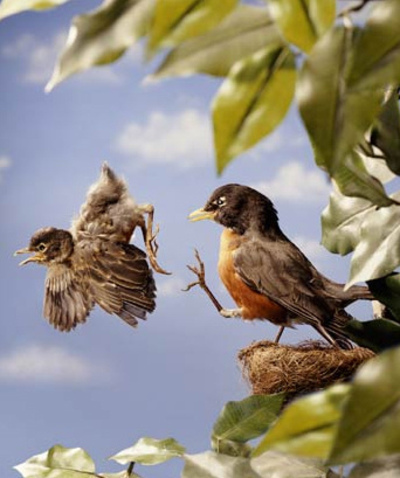 Slowly the mother bird will stand farther and farther away from the nest, forcing the baby bird to come out of the nest in order to get food. The bird realizes it needs this food to survive and this is the motivation for them to venture out onto a branch. Chances are the first few times the bird will fall down to the ground, but this repetitive process slowly becomes habitual to the bird. It will eventually learn that it can ease its falls by spreading its wings. The bird will become accustomed to this idea and every time it falls, it will attempt to flap its wings more and more. The result of not falling to the ground is something known as positive reinforcement. The result of not falling/ being able to fly its way back up to get food will motivate the bird to fly more often. How do Birds Learn to Fly? Reading your las paragraph, I couldn’t help but smile at the parallels between a bird pushing the baby from the nest, and a human parent kicking you out of the house to go get your own life, ha ha!